Bring the Bible vividly to life for your 8s to 12s with all the bits kids love but preachers tend to miss. Every colourful story ends with an exciting cliff hanger and a question you can only solve by going to the Bible. With his top choice of 50 Wackiest Bible stories, favourite children’s author and illustrator, Andy Robb returns with a book that’ll certainly make your 8s to 12s sit up and take notice of the Bible. Wacky stories – if adults were as honest about them as kids – include taking on a nine-foot giant, a dealing with a puppet king, a stunning disco dancer, how to hitch a lift on a big fish travel, get a fresh drink out of a rock, the right and wrong ways to carry a box the size of a coffee table, what we can learn from the tiny ants, why it might be better to live on your roof than inside your house – and whole lot more. With full colour pages of comic book pictures and fast paced narratives, children learn about wacky ways of travelling and doing things popular with Bible heroes and heroines. They discover what Jesus said about pearls and pigs, about wolves acting up as sheep and how to be a shining light. There’re some scaredy-cat secret agents who seriously let themselves down as undercover spies and find out about a host of fantastic Earth changing double acts. With his own fun style of storytelling, Andy Robb brings fifty more Bible stories vividly to life and leaves every one with a cliff hanger and a question that you can only solve by going to your Bible to find out how the story ends. This has to be the best way to introduce 8s to 12s to the wonders and marvels of the Bible through words and pictures that really grab their attention, hold it and send them to the Bible for more of its life changing truth. 50 Wackiest Bible Stories by Andy Robb was published by CWR in October 2013 and is our 12352nd best seller. The ISBN for 50 Wackiest Bible Stories is 9781853459832. 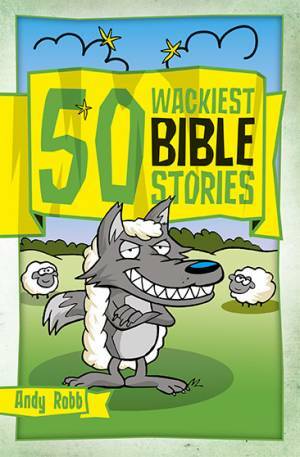 Be the first to review 50 Wackiest Bible Stories! Got a question? No problem! Just click here to ask us about 50 Wackiest Bible Stories. 50 Wackiest Bible Stories Product. A nine-foot giant, puppet kings, a dazzling dancer, big fish travel, getting a drink out of a rock, the right and wrong ways to carry a box the size of a coffee table, what we can learn from ants, why it might be better to live on your roof than inside your house - these are just a few of the stories that you can enjoy between the covers of this very wacky book. You can learn about odd ways of travelling and odd ways of doing things. You can discover what Jesus said about pearls and pigs, wolves pretending to be sheep and how to be a shining light. You can get the heads up on some scaredy-cat spies and find out about a host of unusual dynamic double acts. Using colourful cartoons and his own fun style of storytelling, Andy Robb brings fifty more Bible stories to life. In every one, he leaves you with a cliff hanger and a question - but don't worry, he tells you where to look in your Bible to find out how the stories end!